A multiferroic material can be switched on and off at will simply by applying alternating voltage. Doing so allows it to carry power from one point to another through the cascading spins of electrons rather than by actually moving them. This complex magnetic effect is called a spin wave bus, but you can think of it a bit like an ocean wave. The energy of the wave moves in toward shore, but individual water molecules don’t have to go anywhere they just move up and down as the wave passes. The team actually designed a chip to test the ability of a multiferroic material to maintain a stable spin wave bus. The device used in this experiment consisted of a nickel-based film atop a piezoelectric substrate the piezoelectric layer is where the initial voltage was applied to generate the spin wave. Down the middle of the chip was a 5 micrometer wide ferromagnetic stripe where all the action took place (that’s the gold line across the middle of the image at the top, and the green strip in the diagram above). 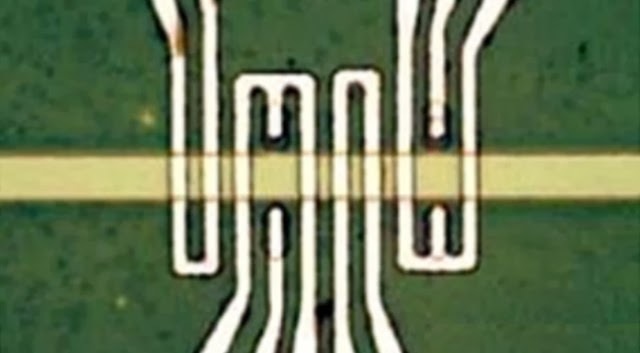 This stripe acted as a waveguide for the spin wave bus, directing power from one end of the circuit to the other without moving any electrons.